If you ever connected to the Internet before the 2000s, you probably remember that it made a peculiar sound. But despite becoming so familiar, it remained a mystery for most of us. What do these sounds mean? As many already know, what you're hearing is often called a handshake, the start of a telephone conversation between two modems. The modems are trying to find a common language and determine the weaknesses of the telephone channel originally meant for human speech. Below is a spectrogram of the handshake audio. I've labeled some signals according to which party transmitted them, and also put a concise explanation below. Hello, is this a modem? The first thing we hear in this example is a dial tone, the same tone you would hear when picking up your landline phone. The modem now knows it's connected to a phone line and can dial a number. The number is signaled to the network using Dual-Tone Multi-Frequency signaling, or DTMF, the same sounds a telephone makes when dialing a number. The remote modem answers with a distinct tone that our calling modem can recognize. They then exchange short bursts of binary data to assess what kind of protocol is appropriate. This is called a V.8 bis transaction. Now the modems must address the problem of echo suppression. When humans talk, only one of them is usually talking while the other one listens. The telephone network exploits this fact and temporarily silences the return channel to suppress any confusing echoes of the talker's own voice. Modems don't like this at all, as they can very well talk at the same time (it's called full-duplex). The answering modem now puts on a special answer tone that will disable any echo suppression circuits on the line. The tone also has periodic "snaps" (180° phase transitions) that aim to disable yet another type of circuit called echo canceller. Now the modems will list their supported modulation modes and try to find one that both know. They also probe the line with test tones to see how it responds to tones of different frequencies, and how much it attenuates the signal. They exchange their test results and decide a speed that is suitable for the line. After this, the modems will go to scrambled data. They put their data through a special scrambling formula before transmission to make its power distribution more even and to make sure there are no patterns that are suboptimal for transfer. They listen to each other sending a series of binary 1's and adjust their equalizers to optimally shape the incoming signal. Soon after this, the modem speaker will go silent and data can be put through the connection. Why was it audible? Why not, one could ask. Back in the days, telephone lines were used for audio. The first modems even used the telephone receiver like humans do, by talking into the mouthpiece, until newer modems were developed that could directly connect into the phone line. Even then, the idea of not hearing what's happening on a phone line you're calling on was quite new, and modems would default to exposing the user to the handshake audio. And in case you accidentally called a human, you would still have time to pick up the telephone and explain the situation. All you had to do to silence the handshake was to send the command ATM0 down the serial line before dialing. Thank you for illuminating one of the mysteries of my past. Very interesting stuff. Thank you for this amazing amount of effort to explain that handshake sequence! I can't say it's been keeping me up at night, but the detailed diagram showing each part of the handshake sequence is beautiful! It's so odd... I used to hate this sound when I got my first PC. I used to try and find ways to either turn it down or turn it off altogether... of course, you couldn't. Not really. But as time went on, I got used to it. Kind of like when you sign on to your computer and the OS greets you with a noise or a song. It was like the Pavlov's Dogs, and I got used to listening for those sounds. You could actually tell if your connection was going to be good or bad (ie, none at all) by the way the sound was modulating. That sound, to me, is like the sound of an old school typewriter. It's primitive, it's annoying, but I do so miss that kind of feed-back in the here and now! Classic stuff. Its quite fun, because the mother of our now (and one not longer a teenager) could hear from the handshake tones who was dialing in. It was a serious distinct handshake. And since I used a USR Courier v.everything and most dialers used Supra and other modems, it was quite easy to hear who connected. The (in the last days of dial up) USR Sportster 14400 could easily be upgraded to 28800bps. But it took the black Sportster to cope to "56k". (v.fast and k56flex). Also the USR Courier V.everything had a set of unpublished commands to measure the line quality. Found them when doing a backup. ATYnn is undocumented. Spectral analysis of line quality. I understand what you mean. Personally, I never found it grating from the start, rather mysterious and transcendent. Like the language of the gods. But I do certainly know the feeling of anticipation in hearing it. A little sad that will never know that sound (or a typewriter or even a desktop keyboard) anymore. Makes me a good bit wistful. So, would you like to sell a poster of that? Because I'd like to buy it. RedBubble is selling it now. So interesting! Thanks for the insight into this forgotten part of the Internet! Beautiful. Absolutely, fantastically, nostalgically beautiful! Thanks for this article, I really enjoyed it and the accompanying image! What program did you use to generate the spectrogram? Baudline by SigBlips. Also Gimp and other image postprocessing. What an awesome signal analysis job you have done. You broke it down, demodulated parts, decoded bits, and understood a crazy handshake protocol. It must of been a lot of work. I am beyond impressed. Wow! Thank you! It was a fascinating journey indeed. Very cool mashup, just what I was hoping for! Thanks for sharing! Very cool! I'm wondering, did you just look up the conversation data or did you use something to sniff the data off of the modem line? I wrote a few Perl scripts to demodulate the FSK and DPSK, then manually decoded the bits based on the relevant ITU-T standards. Awesome. I remember working phone support in the 90's for dialup internet users. I would sometimes have people hold their phone up to the modem so I could listen to the handshake, but I never knew exactly what the various parts were for. Thanks! G.994.1 came from the voiceband handshake Recommendations V.8 and V.8bis,"
This sounds like US signaling. We had totally different in Europe and former USSR. It is indeed a U.S. dialtone. Thanks for such a nostalgic read! I think I just played the sound clip about 20 times. 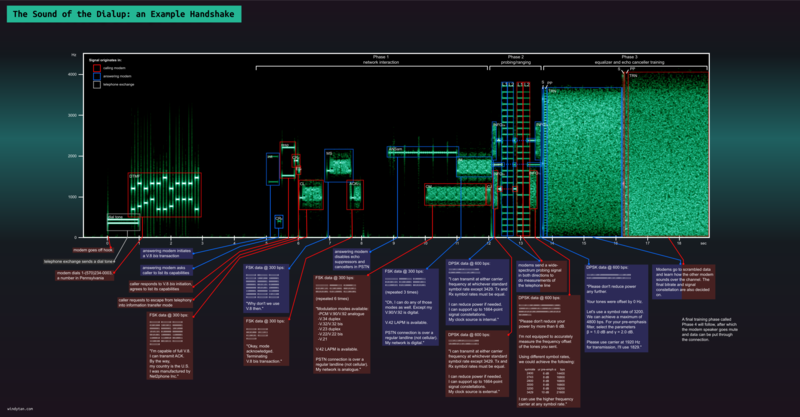 I would love to print a large format poster of the spectrogram with all your notes and put it up in my office. Would you mind sending me a high-res version that would print really clear? A vector version if you have it is best? your lastname must sound a bit like the krrrBliipkrraaa sounds of my good old modem of mine carefully chucked in a box in the cellar. But what an interesting and great article ! Thank you, Oona. This brought back fond memories. My first modem use was in 1979 with 300 Bps and then in 1981 with 1200 Bps. In the late 1980s I used a 2400 Bps modem for the first time and loved it. The move to actual Kbps speeds and then digital modems, and then routers were all just normal parts of an evolving network. But I realized I missed the modems' sounds and control/handshake sequences, which allowed an engineer to more closely follow and understand the data transmission process. We've coma a long way, and we should capture this kind of thing to remind us of the journey. I remember when I got my first 2400 baud modem @ an amiga show in NY, it was between that or a digiview video digitizer. Best purchase I ever made. I also remember when my friend bought a 14.4 baud modem, those days it was crazy fast! ah the memories BBSing late into the night, of board games and war games dialers.. those were the days..
Yeah, 33.6 was a superhighway compared to 2.4. I couldn't have imagined text flowing so fast. Terrific! The infographic is great - those conversation 'balloons' really help to understand what's happening. Thank you! Thanks for reading! I also had it as a ringtone for some time, gave me some true old-skool street cred. Thank you, made me happy! Thank you for a great post! I remember the moment that my boyfriend and I learned that acoustically coupled 300 baud modems can't parse the sound of a vacuum cleaner. It did try! Screen after screen of garbage! I think there's a few issues with the labelling (as far as which is sent by the calling modem and which by the answering modem). In the V.8bis transaction CL is sent from the answering modem, NOT the calling modem (so the MS and ACK(1) packets are sent by the other modem as well). Also, it seems as if the phase 2 labelling was referenced from the V.34 standard (which V.90/92 is based on). However, in V.90, these "roles" are often reversed (based on which modem is analog and which is digital) - this can be verified as to which wide-spectrum probing signal is "sharper" (because it's the one being sent by the calling modem). Don't get me wrong, I love this post - it's inspired me to learn all the different V-series standards and try to build my own dialup modem! Cool, thanks for actually taking the time and reviewing this! :) I've been wondering why no-one has pointed out any mistakes. Maybe I should make a bugfix version in the future. Thanks a lot for enlighting us! Kind Regards from Barcelona, Spain. I have to say that this has got to be the most detailed discretion of modem handshaking that I've ever seen. Thank you for making this pic, so cool!! You have an awesome blog! This post really gave me the fuzzies - I remembered the days of dialing into BBS's with my brand new 14k bps modem. Never realized that what sounded to me like random beeps and fizzes was actually my modem having a civilized conversation! Thanks! I still hear this sound in my dreams. I remember I could tell the connection speed after hearing the handshake. Travelled all over the world from home, (BBB=Bergen-by-Byte, anyone? ), and it ended up as my iPhone ringtone at some point. Thank you for the remembrance! I remember calling my friend's house to play some Doom. His mother would always pick up the phone and I'd listen to them argue over the sound of a lonely handshake attempt. Thanks for the memories and great info. Wow! In 30 years of using computers, I've never seen an article on modems as beautifully written as this! Many thanks for educating us. OK, I just had a flashback. Wasn't there a version of the handshake that did a 'bong' twice? Was that a USRobotics version? That 2x 'bong' is the DIL signal of V.90, which is a more-or-less modem-specific signal. But yes, I believe it's the USRobotics version. This is a long time coming: thank you for the scientific and artistic work you put into this. I bought a copy of the poster about a year ago and just recently completed the project I imagined when I first saw this post. I cut a larger poster frame to size and mounted the poster. Then, using a greeting card sound module (happy mistake choosing that! More on this in a moment) recorded the sound directly from the link in the article above. When I first listened to the sound clip, something sounded off. After recording it on the sound module and listening to it via the cheap speaker, I realized that the sound quality from my computer speakers gave that familiar old sound an unnatural quality. The sound module more or less recreated the quality of sound that came from the modem speaker. With either a bigger budget or greater artistic talent, I'm sure a more impressive result could be found but this is what I ended up with and I'm happy to have it on my wall. Thank you, Oona, for your contribution and sparking the thought of doing this! From reddit, Fantastic analysis of this! I've heard of people hating this sound, but it's always been beautiful to me. I grew up with simple 300 baud initially, just simple FSK. To hear things progress, and as better/more efficient modulations came out as time went on, this was literally music to my ears. I always had my modem audio on for the handshake. The better modems even had a volume slider. For the WHY portion, you're probably not going far enough in what you said. Since many times, when calling BBSs and services (like Compuserve, Delphi, or Prodigy), you were often calling blindly. You got the number somewhere, but mistakes were common, BBS numbers were mixed with fax numbers, and voice numbers. I used to hear voices or fax tones (which are easily distinguishable from straight-modems) and you'd know something went wrong. Otherwise, you're just waiting about 30-45 seconds for a "Connect 1200" or other similar message to appear. It's boring, so why not listen to the handshake in case something cropped up. Also, you learned to "troubleshoot" the modem connection. Sometimes, due to poor quality phone lines, you could hear it "refuse" the faster connection rates, and the extra long training phase you knew it was going to be slow. That's useful information! Found your vid on youtube while trying to teach a youngster about what DUN is. Came across this website in the comments and very happy! Definite bookmarking and sharing material! My super-eggheady friend once knew someone who could complete a handshake via whistling. Question, V.32-modems or for instance V.34-modems were using carrier frequencies like 1800 Hz or so for sending the data. Why is it we're not seeing and hearing this carrier frequency when the modems are sending and receiving data after closure of the handshake-procedure, but just a lot of noise in every frequency band between 0 - 4 kHz? In a way, you are hearing just the carrier, but its amplitude and phase are varying so much so fast that it creates other frequencies around the carrier. This is due to mathematical properties of sines. The appearance of noise is just our inability to track the modulation at such a high speed. Thank you so much for share the picture and your explanation about the language of the modems I used once before. I always wanted to know about it. Thank you. Why do they include quality information about 3429, if neither supports it? Or am I misunderstanding anything? Hi, if I remember correctly the list of symbol rates is always the same length, independent of what the parties claim to support, for the sake of simplicity in the protocol. No additional logic is needed to determine how many bits should be read from that field. What is the allowable delay time from connection to the initial V.8 bis transaction? I see it is almost instantaneous in your example. What if the delay is 11 seconds or more before the answering modem starts the V.8? Can this be configured? How does this compare with DSL signalling, do those modems have a similar handshake?